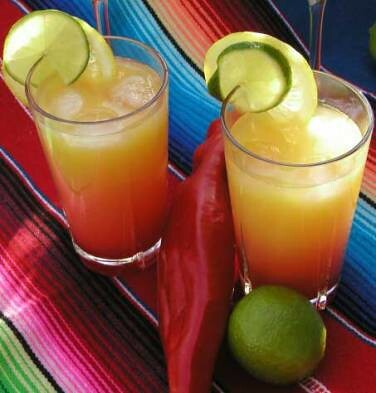 Stir orange juice and tequila with ice. Add ice cubes. Pour in grenadine slowly and give it time to settle. Stir before drinking. oh man tequialla.... nasty stuff!! This is a classic I've not yet tried! Looks lovely and bright, would really cheer me up on a grey day like today. It does look beautiful, rather like a sunrise, though since we are more likely to be drinking in the evenings, perhaps it should have been a sunset! I always feel sorry for the worm, sitting in the bottom of a true bottle of Tequila. 'Billy no mates' springs to mind! I just don't feel he would have much in common with the ones chewing my Brussels sprouts, language barrier an all that!